A year after Ukraine averted default by reaching an agreement with creditors to restructure $18 billion of debt, the country’s bond market is again beginning to veer off course. After outperforming all of emerging Europe in the first seven months of the year, some of those gains unwound as a flare-up in tension with Russia over Crimea heightened security concerns. The selloff demonstrates the fragility of investor confidence as the country struggles to rebuild reserves amid a freeze in aid from the International Monetary Fund. “The rally in Ukrainian bonds has been driven by short-term money, which has the potential to leave the market very quickly,” said Vladimir Miklashevsky, a senior strategist at Danske Bank A/S in Helsinki, who recommends selling all but Ukraine’s shortest-maturity debt. “There’s still too much uncertainty about the IMF program and political risk to talk about Ukraine issuing new debt” as the aid program envisioned, he said. Ukraine bonds rallied 14 percent this year through July as emerging-market funds boosted allocations almost threefold in the hunt for higher yields. The country accounted for 1.4 percent of their bond portfolios at the end of July, a level similar to holdings in India, Kazakhstan and Romania, ING Groep NV said in a research note this month, citing EPFR data. Yet hot money flowed the other direction this month as Russian President Vladimir Putin accused Ukraine of terrorism in Crimea and his counterpart in Kiev, Petro Poroshenko, warned of a possible invasion by Russia. Yields on debt maturing in September 2019 jumped 39 basis points to 8.28 percent in August, heading for the biggest monthly increase since February when the resignation of the economy minister revealed growing dysfunction in the government. Tensions between the two countries and escalation in the more than two-year-old conflict with pro-Russian separatists in Ukraine’s easternmost regions has weighed on the Ukraine’s growth outlook. So-called GDP warrants, which pay holders once gross domestic product exceeds $125 billion and were part of the restructuring, have lost a fifth of their value this year as prospects for recovery wane. The $91 billion economy is forecast to contract 0.5 percent in the next two quarters after expanding 1.3 percent in the three-month period ended in June, according to Bloomberg surveys and government data. 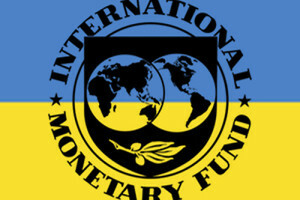 While Ukraine’s international reserves have increased about 35 percent to $14 billion since last year’s debt deal, they are still about $6 billion short of where they could be if the country had received disbursements from the IMF’s $17.5 billion aid program, according to Dragon Capital in Kiev. Political wrangling and delays in reforms prompted the IMF to put the program on hold last year. Rising political risk, slowing growth and stagnant reserves are still weighing on the nation’s credit outlook. Ukraine has a 17.8 percent chance of defaulting in the next year, according to a Bloomberg measure which takes into account factors like economic growth, outstanding debt and political risk. That’s the third-highest in the world after Venezuela and Greece. Ukraine is rated B-, six levels below investment grade, by S&P Global Ratings.